Playland will be open from 10am-6pm each day. Concert goers will be wristbanded when they come into Playland and can come and go in and out of the concert throughout the day. Timbre Concerts and CRESCENDO1 are proud to present the first annual BREAKOUT Festival. This is an all-ages show with a 19+ VIP section. VIP tickets are valid for 19+ ONLY (Two pieces of government issued photo ID will be required for entry). BREAKOUT Festival 2018 will bring a one-of-a-kind experience to festival goers of all ages. Taking place this summer over two days at Vancouver’s historic PNE Amphitheatre, festival tickets will include access to the concert area and Playland with over 35 rides. Additional festival attractions include a VIP section, a food truck area, 19+ bars, an alcohol-free zone, a merch area and more. 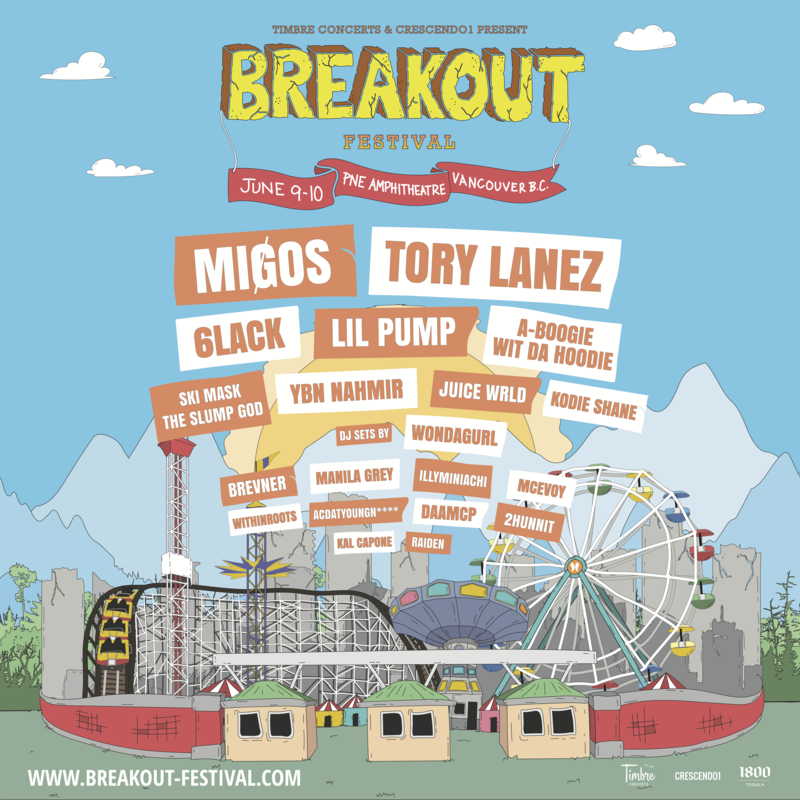 BREAKOUT Festival is going down at PNE Amphitheatre at 2901 E Hastings St, Vancouver, BC, Canada. The #014 #095 #N35 and #016 busses stop on Hastings and Renfrew, right in front of PNE. Amphitheatre gates will open at 2pm – 10pm sharp. Playland hours are from 10am – 6pm. No. Curfew is 10pm both nights. Yes! The price of your ticket includes a ride pass and entry into Playland from 10am – 6pm for the same day you have purchased a ticket for. Can I leave the amphitheatre to go to Playland and then come back? Yes! That’s why we included a ride pass with your ticket. Access to Playland is available from 10am – 6pm but cut off time to enter Playland is 5:30pm. Guests are subject to security search when going from Playland to Amphitheatre. No. You will not be able to come back in if you leave the Amphitheatre or Playland. Once you’re in, you’re in. The Ticketleader Will Call box office located at the Amphitheatre main entrance opens at 12pm. At the Amphitheatre Will Call box office starting at 12pm. I haven’t received my e-ticket yet. When will I get that? E-tickets are emailed to you 48 hours before the event. There will be a ticket booth operated by TicketLeader for ticket sales and ticket resolution. This will booth be open at 10am at Playland Main Entrance Gate 13 or at the Amphitheatre entrance at 12pm. Tickets will only be sold while quantities last. This event is all ages but to purchase VIP tickets you must be 19 and over. You should always bring your ID. You will need ID if you plan on purchasing alcohol or picking up will call tickets. Will alcohol be served if I’m over 19? Yes! There will be several bars. You must present two pieces of valid ID though (one photo). What do I get if I purchase VIP tickets? Unfortunately, there are no refunds on tickets purchased. This lineup is subject to change and if anything happens it will be announce on Breakout Festival’s social media feeds right away. You must present the credit card or ID of the person who purchased the tickets. If you need to transfer your ticket to another name you need to do so at least 1 day before the event. You can contact Ticketleader to do that here: 604-252-3700. Confirmations will be sent out by Tuesday, May 28th. Non-professional cameras will be allowed. DSLR cameras, drones, and professional video cameras are not permitted without a media pass. There is only one stage at BREAKOUT Festival. Unfortunately no. Your 2-day wristband must be in tact and cannot be cut off or it will become invalid. You can see the single day lineup under the ‘Lineup’ tab on the Breakout Festival website. Set times will be released closer to the date on this website and social media feeds. BREAKOUT Festival will be held outdoors – rain or shine. Yes! We will have a few different food trucks including plant-based, gluten free and tons of other yummy options. See our list of restricted items here. Please note: backpacks are allowed, however it’s quicker to enter without one. We will provide free water stations and you will be allowed to bring in soft plastic bottles (empty). Yes the event is wheelchair accessible. No, we do not have translators on site. We will be working with the VPD to ensure safety of all patrons attending. Pat downs and bag checks will be issued upon entry. Restricted items will be taken by venue security before entering the premises . ​My son or daughter would like to attend this event but I don’t want to go. Is this event safe for teenagers without supervision? We will do our best to ensure the safety of all patrons, no matter what age. We will have a strict policy on drugs and underage alcohol consumption but we aren’t babysitters. This is up to each parent’s discretion. What if I want to accompany my child to the festival but don’t want to buy a ticket? We will have a parent’s room located at The Hastings Room on site (open 1:00pm – 10:30pm). Unfortunately, there won’t be lockers. Yes. PNE parking is $20. Can I promo my upcoming event or sell my own merch or mixtape? No. We reserve the right to confiscate any items being sold or distributed without our approval. If we’re interested, we will contact you. Not the other way around. We aren’t accepting volunteers on this event at this time.